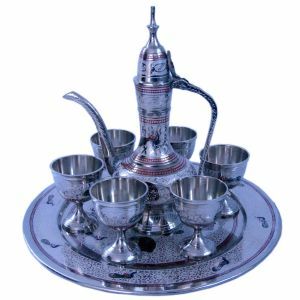 This Handcrafted Rajasthani real and usable royal wine set in antique pattern is made of white metal. The surahi, glasses and the tray are decorated with fine colourful meenakari work all over. The Wine set consists of 6 small wine glasses 2.5 inch high of capacity around 30ml each, one dispensing surahi around 10 inch high of capacity around 90ml and a round serving tray of diameter approx. 9.5 inch. quality commitment: Original design, genuine material.